This entry was posted in Academic achievements, Students and tagged College of Education on July 3, 2014 by Wire Eagle. 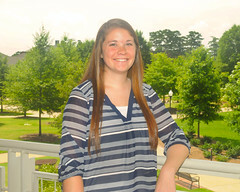 AUBURN UNIVERSITY – During the July 4 weekend, when most people will be celebrating the holiday without a lot of thought about the history it represents, Erica Marie Vatella will be immersed in the study of American history as she pursues her master’s degree at Auburn University in secondary social science education. Vatella was recently awarded a James Madison Memorial Foundation Fellowship, which assists teachers earning a master’s degree with a focus on Constitutional studies. Named for James Madison, the nation’s fourth president and the acknowledged “Father of the Constitution and Bill of Rights,” the fellowship is funding up to $24,000 of Vatella’s graduate studies. The award goes to just one outstanding student in each state and supports the graduate study of American history by aspiring and experienced secondary school teachers of American history, American government and social studies. This entry was posted in Campus Announcement, Community and tagged Auburn Transition Leadership Institute, College of Education on February 24, 2014 by Wire Eagle. AUBURN UNIVERSITY – The Auburn Transition Leadership Institute will host its 24th Alabama Transition Conference March 3-4 at the Auburn Marriott Opelika Hotel and Conference Center at Grand National in Opelika. The conference brings together parents, students, agencies, businesses, educators and policymakers who will gather to share ideas and work toward the goal of preparing young people with disabilities to live independently. The Auburn Transition Leadership Institute, established in 2000 at Auburn University, is affiliated with the College of Education and the Department of Special Education, Rehabilitation and Counseling.